Utagawa Hiroshige (1797-1858) Famous Places of the Eastern Capital (Toto Meisho): Fireworks at Ryogoku Bridge, Early 1830’s. Oban. This is an important and early print by Utagawa Hiroshige, the most important Japanese landscape artist of all time. 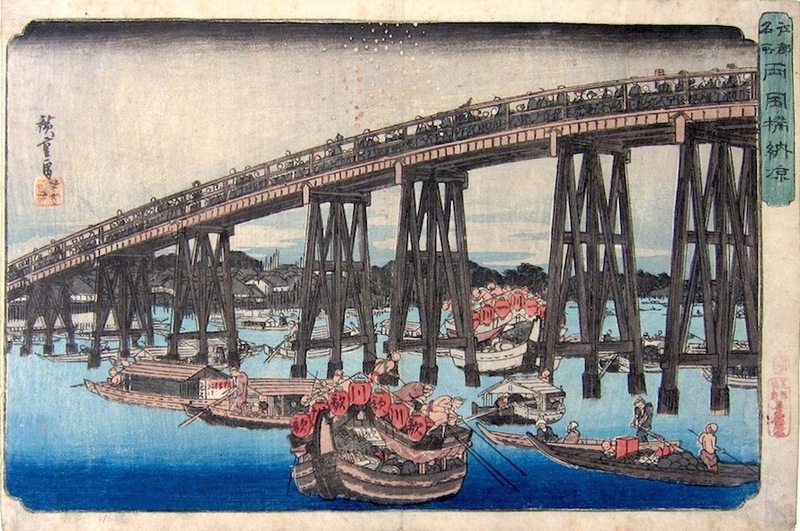 Famed principally for his many series of Tokaido Road prints which he started in 1832, this print follows almost immediately afterwards. The full title is Ryogokubashi Noryo (People enjoying the evening cool and watching the display of fireworks, in boats at Ryogoku). ...very soon after the publication of the First Tokaido, begins a notable series of Views of Yedo in similar format, the number of which has not been exactly ascertained. The issue extended over a period of not less than ten years; earlier examples having the red stamp of the publisher, Kikakudo, followed by others with the mark Sanoki, a "portmanteau" title derived from his private name Sano-ya Kihei; but both referring to the same firm. This series contains many fine specimens of the artist's powers. He depicts Yedo and its neighbourhood under every conceivable condition - lonely and deserted scenes, crowded streets, river festivals, flower viewing, temples, rain and snow, day and night - a wonderful panorama of the life and beauty of the Shogun's capital in the last phase of its existence under the old government. Tokyo, the modern Yedo, has been ravaged with fire and earthquake; the reforms of Meiji must already have obliterated much of the city that Hiroshige loved so well and painted so faithfully. One wonders whether the historical and topographical value of his prints has yet been realized by his fellow countrymen. Perhaps now the value of these prints is recognised. This particular print in similar condition is on sale elsewhere for $2800. This example is in good condition overall, the colour has faded a little but the impression is good. The print bears the early red stamp of the publisher Kikakudo. The print is number 67 in the Watanabe catalogue of the Hiroshige Memorial Exhibition.